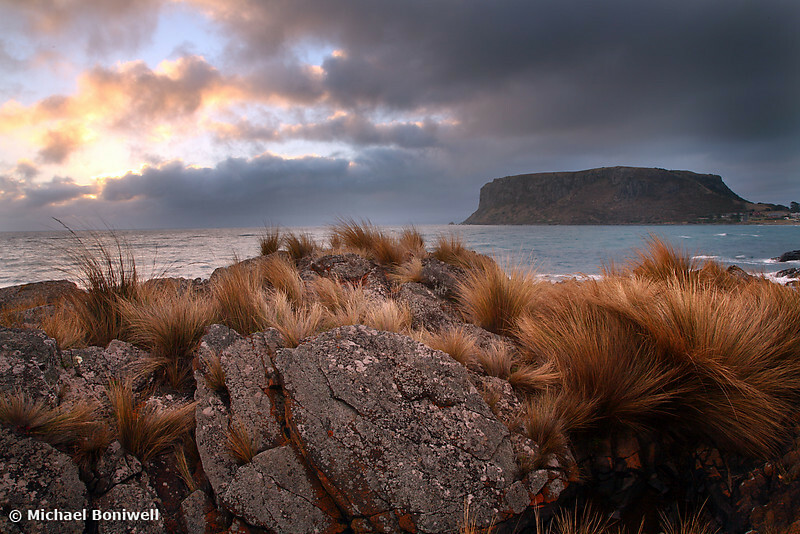 "The Nut" as it is commonly known is an ancient volcanic plug looming over the little fishing village of Stanley in the far north-west of Tasmania, Australia. With family growing up nearby I'd visited many times over the years, enjoying the steep hike up the peak and the historic buildings and appealing eateries of Stanley. On this trip I was alone and free to pursue my photographic interests. This shot was captured during the last hours of light. A fierce off-shore wind had taken up residence and threaten to sap my enthusiasm, but just as I was beginning to ache from cold golden light caught the grasses and the wind abated offering this striking natural landscape.